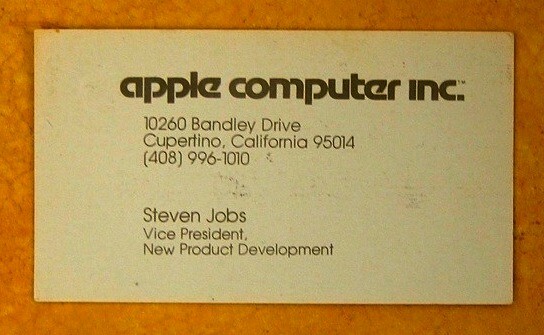 What you're looking at below is a photo of Steve Jobs' business card circa 1979. There are a few things to note here. First, though Jobs helped co-found Apple, he never served as the company's CEO until he returned to Apple in 1997. Previously, Jobs served as Apple's VP of New Product Development (as shown below), and later on as the VP and General Manger of the Mac department before he was ousted by John Sculley in 1985. Second, Jobs' business card, on the surface, looks particularly ordinary for a man so focused on creative design and aesthetic appeal. But Mozilla Labs director Pascal Finette, who originally tweeted the photo of Jobs' business card after a co-worker brought it in, explains that there's more to the card than meets the eye. Third, the number listed on the card still connects to Apple's main switch board. Seriously. Try giving it a call. Fourth, and for all you typeface nerds out there, the font used above for "Apple Computer Inc." is Motter Tektura, which oddly enough, is also heavily used by Reebok. No doubt this card was printed before Jobs starting wearing New Balance. 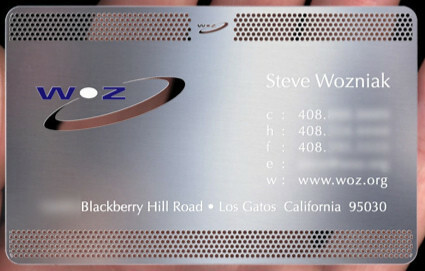 Lastly, and while we're on the topic of business cards, here's what Apple co-founder Steve Wozniak's business card looked like circa 2006 (I'm not sure if he still uses this design today). In any event, the card below is comprised of stainless steel and features both laser and hand painted lettering.